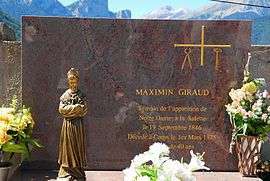 Pierre Maximin Giraud (26 August 1835 Corps, Isère, France - 1 March 1875 Corps, Isère, France), known as Maximin Giraud, was a French member of the Corps of Papal Zouaves and a Marian visionary to Our Lady of La Salette. Maximin Giraud was born on August 26, 1835, in Corps en Isère. His mother, Anne-Marie Templier hailed from this same region. His father, Germain Giraud was from the neighboring district of Trièves. The mother died leaving Maximin, then 17 months old, and a daughter, Angélique, who was eight years of age. Shortly after, Germain Giraud, a wheelwright by trade, remarried Marie Court. His new wife was reportedly not interested in Maximin and even neglected the child. Maximin grew up in haphazard fashion, spending much of his time with carefree abandon in the sole company of his dog and goat as they roamed the streets of Corps en Isère. Attendance at school was not compulsory and so he never frequented classes. The same was true with regard to religious instructions. Giraud spoke the Vivaro-Alpine (Dauphinois) dialect of the Occitan language, as did everybody in town, but he did learn a few words of French as he circulated among the wagon-drivers and travelers at the stage coach relays. He was 11 years old in 1846. Our Lady of La Salette with Mélanie Calvat and Maximin Giraud. On 19 September 1846, about three o'clock in the afternoon, on a mountain about three miles distant from the village of La Salette-Fallavaux, it is related that two children, a shepherdess of fifteen named Mélanie Calvat, called Mathieu, and a shepherd-boy of eleven named Maximin Giraud, both of them uneducated, beheld in a resplendent light a "beautiful lady" clad in a strange costume. Speaking alternately in French and in patois, she charged them with a message which they were "to deliver to all her people". After complaining of the impiety of Christians, and threatening them with dreadful chastisements in case they should persevere in evil, she promised them the Divine mercy if they would amend. The lady also said something in secret to each of the children. As she spoke to each in turn, the other could see her lips move, but could not hear what she said. The apparition was approved by Mgr. Philibert de Bruillard, Bishop of Grenoble November 16, 1851 under the title of Our Lady of La Salette. Both secrets were written down by the visionaries and sent to the pope in the same year. "If my people continue, what I will say to you will arrive earlier, if it changes a little, it will be a little later. France has corrupted the universe, one day it will be punished. The faith will die out in France: three quarters of France will not practice religion anymore, or almost no more, the other part will practice it without really practicing it. Then, after [that], nations will convert, the faith will be rekindled everywhere. A great country in the north of Europe, now Protestant, will be converted; by the support of this country all the other nations of the world will be converted. Before all that arrives, great disorders will arrive, in the Church, and everywhere. Then, after [that], our Holy Father the Pope will be persecuted. His successor will be a pontiff that nobody expects. Then, after [that], a great peace will come, but it will not last a long time. A monster will come to disturb it. All that I tell you here will arrive in the other century, at the latest in the year two thousand." During the three years following the apparition, his half-brother Jean-Francóis, his stepmother and his father died. His mother's brother, called oncle Templier became Maximin's guardian. After the apparition, he was placed as a boarder in the Sisters of Providence School in Corps en Isère, where an inquiry concerning the apparition took place. His progress in school was slow, hampered by constant pressure from pilgrims and other curious people. When the boy sensed insincerity on their part, he would make up nonsense about the revelation, which tended to complicate matters when the statements were later circulated. Against the advice of the parish priest and defying the orders of the bishop of Grenoble, Royalist partizans brought Giraud to Ars to meet Saint Jean Baptiste Marie Vianney three times, to be questioned by him upon the apparitions. Giraud reportedly did not enjoy their company but enjoyed the ride and the chance to see new sights. He thereafter moved from place to place. He entered the Minor Seminary of Rondeau in Grenoble, afterwards moving to the abbey of the Grande Chartreuse. From there, he travelled to Seyssin, and then to Rome, and thence to Dax, Aire-sur-l'Adour and Le Vésinet, then to Tonnerre, to Jouy-en-Josas near Versailles, and finally Paris. Maximin tried his vocation as a seminarian, and after that, he worked as a nursing-home employee and a medical student. Failing the state examinations, he got a job in a pharmacy. In 1865, the Marquise de Pignerolles gave him a trip to Rome, where in April, Maximin enlisted as member of the Corps of Papal Zouaves, who were responsible for the defense of the Papal States and the protection of the Pope. Because of his brief time at the Paris Medical School in 1862 he is assigned to the Health Service as a nurse. His time in the Zoaves combined a religious element, with his interest in the military, and his brief medical training, in an atmosphere of camaraderie. While there he worked on his memoirs, an account requested by Madame Jourdain. In his subsequent writings, Giraud noted with pride his service with the Zoaves. Giraud saw no major battles and after his six-month contract ended, he returned to Paris. 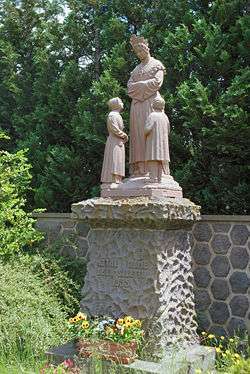 The newspaper La Vie Parisienne published an attack against la Salette and the two children. Giraud protested and the newspaper printed a correction. In reaction towards this, in 1866 he published a short work called Ma profession de foi sur l'apparition de Notre-Dame de La Salette. It was during this time that the Jourdain family, a couple devoted to him, brought a measure of stability into his life, and, at financial risk, cleared his debts. In 1869, Giraud then entered into a partnership with a liquor dealer who used his now-famous name to increase sales. Giraud was fraudulently abused by him and failed to profit from the association. In 1870 he was drafted by the Imperial Army and assigned to Fort Barrau in Grenoble. Following this he returned to Corps and was joined there by the Jourdains. The three lived poorly and were helped by the fathers of the shrine with the approval of the bishop. In November 1874 Giraud made a pilgrimage to the shrine. In the presence of a rapt audience he repeated the story of La Salette as he had done on the very first day. This would be the last time he would do so. In February 1875 he visited the parish church, also for the last time. On the evening of March 1 Giraud received the sacrament of Penance and Holy Communion, made his last Confession and drank the La Salette holy water to swallow the Eucharist. Shortly thereafter he died, not yet 40. I believe firmly, even to the shedding of my blood, in the famous apparition of the most Blessed Virgin on the holy mountain of La Salette, on September 19, 1846, the apparition that I have defended in word and suffering. ... It is with this spirit that I give my heart to Our Lady of La Salette. Sociologist Michael P. Carroll hypothesizes that the apparition may have grown out of an initial hallucination, shaped by an unconscious desire on the part of Maximin to punish his step-mother for mistreating him. Indications that Maximin may have on occasion gone hungry would be reflected in the predicted punishments relating to famine. Both Melanie's and Maximin initial impression of the weeping woman was that of a possible victim of domestic violence. In one interview Maximum said that he thought of a woman "whose son had beaten her and then left her". An edition of July 3, 1851 was reproduced on request of Benjamin Dausse, a friend and trustee of Maximin. 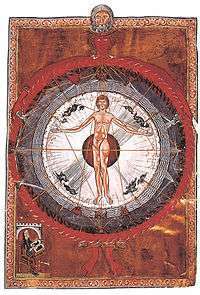 A third edition was produced on August 5, 1853 at the request of Jacques-Marie-Achille Ginoulhiac, the new bishop of Grenoble, who was unacquainted with the secret. 1 2 Bert and Costa (2010: 18). Bert, Michael, James Costa. 2010. "Linguistic borders, language revitalisation and the imagining of new regional entities", Borders and Identities (Newcastle upon Tyne, 8–9 January 2010), 18. (French) Rousselot, Pierre Joseph. 1848. La verité sur l'événement de La Salette du 19 September 1846 ou rapport à Mgr l'évêque de Grenoble sur l'apparition de la Sainte Vierge à deux petits bergers sur la montagne de La Salette, canton de Corps (Isère). Grenoble: Baratier. (French) Rousselot, Pierre Joseph. 1850. Nouveaux documents. Grenoble: Baratier. (French) Rousselot, Pierre Joseph. 1853. Un nouveau Sanctuaire à Marie, ou Conclusion de l'affaire de La Salette. Grenoble: Baratier. (French) Giraud, Maximin. 1866. Ma profession de foi sur l'apparition de Notre-Dame de La Salette. (1st edition.) Paris: Charpentier. (French) Giraud, Maximin. 1870. Ma profession de foi sur l'apparition de Notre-Dame de La Salette. (Reprint.) Paris: Charpentier. (French) Giraud, Maximin. 1873. Ma profession de foi sur l'apparition de Notre-Dame de La Salette. (Reprint.) Paris: Charpentier. (French) Laurentin, René and Michel Corteville M.S. 2002. Découverte du secret de la Salette. Paris: Fayard, ISBN 2-213-61283-8. La Salette at www.christ-roi.net (French).